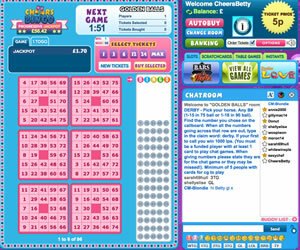 Cheers Bingo opened to players on 21st November 2012 and the bingo games are powered by the Bingo Vision software as part of the 15 Network. This brand is the sixth to launch on the network so if you are looking for something a little less 'packed' when you step into the gaming rooms, don't presume that because this is a networked brand that player numbers are high. In fact, quite the opposite (at the time of the review); player numbers are high enough to create standard size house prizes but not too high that it is hard to maintain a conversation in the rooms. When you land at the site for the first time it has the feel good factor about it with party streamers cascading in the background and dotted across the design, fireworks exploding and champagne glass clinking all make you think of good times. 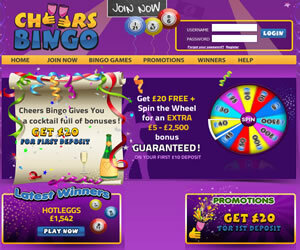 To get in on the action offered by Cheers Bingo you do have to register an account and like all brands on the network, financial details are required in order to play at the site. Of course you can choose not to make an instant deposit but look around the site before funding your account, the financial details are for verification purposes only. Once you have completed the sign up process you have a number of options including creating your profile at Cheers Bingo. You can do this from the 'My Account' section of the site. Doing so means you can upload a picture and share a few details about yourself with other members of the site. Additionally this area is where you can also add friends to your list, check out transactions and redeem loyalty points that you have earned by playing. The site doesn't offer as many varieties of bingo as other brands online today, just 75 ball pattern and 90 ball games are available. There are also only a few rooms, some of which are not open 24/7. Jackpots are also quite limited here, you certainly won't be winning life changing amounts of money from your bingo game with the largest jackpot offered currently being just £1,000. 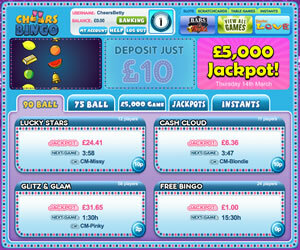 Cheers Bingo currently offers 75 and 90 ball bingo games alongside a selection of instant win games. 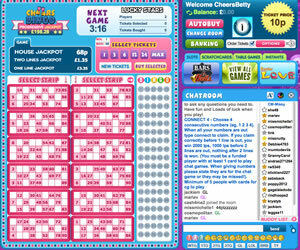 The are no specific wagering requirements at Cheers Bingo you simply have to have wagered at least £30 in real cash in your lifetime as a player with the brand, provided ID and have £30 in real cash in order to withdraw any money from your account. You should note that when you do process a withdrawal that all bonus funds and loyalty points are removed from your account.